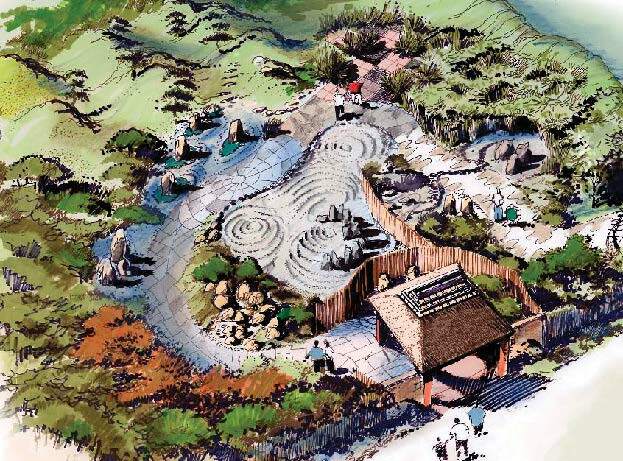 For their Japanese style garden Sansui-design Ltd have chosen the story of Momotaro, a folk story as well known in Japan as Robin Hood is known in England. In Japan the legend of Momotaro is told in both and comic form and is a well loved TV cartoon series. Traditionally japanese gardens use symbols, metaphor and illusion to create gardens with magical spaces, which seek to engage the viewer in many different ways. The gardens represent different landscapes which become stage sets for the viewer’s imagination. For example, Buddhist temples use rock arrangements to represent a variety of deities or revered mountains, and gravel is used to represent water or seas. Also within the Japanese tradition are ‘stroll’ gardens, where the garden is designed to be revealed as the viewer walks around it. As you walk around the Momotaro Garden you will find that the legend is played out before you, making you part of the garden itself. The story of Momotaro follows the time honoured pattern of legend and fables whereby good triumphs over evil. Sansui-design tell the story in the form of a poem for children to engage in, as well as representing key scenes of the story within the garden itself. Visitor’s can follow the garden path enjoying a garden created by traditional techniques to learn more of this fascinating tale, or simply enjoy the peace and tranquillity of the landscapes represented. garden is maintained for you and others. Sansui Design Ltd is a landscape design company based in the UK. Through work in the UK, Europe and the USA, they seek common ground between Eastern and Western approaches to garden design. Sansui Design Ltd lead their clients to the completion of a unique garden, designed to harmonise property and environment. Clients range from private individuals to corporate bodies. Each commission is a unique response to the site, creating a work of landscape art.